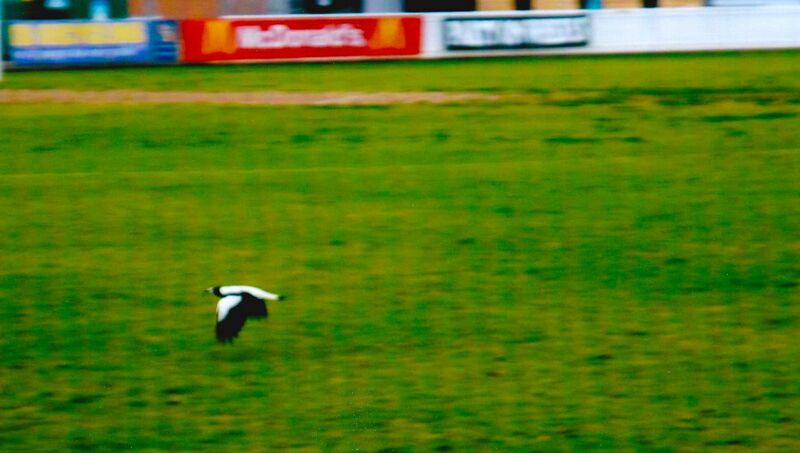 A magpie flies over its rightful turf — the Alberton Oval, home of the SANFL Australian Rules Football Team, the Port Adelaide Magpies. Magpies, it seems, are iconic and demonic at the same time. In the past, they have been viewed in Chinese culture as birds who bring good luck and joy. In many Western cultures, the magpie has had more sinister qualities and has even symbolized evil like its cousin the raven. This good vs. evil framework works well in sports. Magpies are often mascots for athletic teams (e.g. the Australian Rules Football teams, Victoria’s Collingwood Magpies and the South Australia National Football League’s Port Adelaide Magpies just to name a few.) Scavengers and survivors, magpies are quite intelligent and definitely deserve a certain amount of respect.